The A-List Diet. The book walks you through every phase of the program and includes detailed amino-boosting shakes tailored to your specific dieter type. Plus, it includes more than 100 amino-boosting A-List recipes—to make it easier than ever to lose weight and keep it off. In fact, you could lose up to 15 pounds and look years younger in just the first two weeks alone. After that, you can expect to lose up to 5 pounds each week until you achieve your goal. If you haven’t read The A-List Diet yet, get your copy here. Phase One is also known as the Reset Phase. It lasts for 7 days and it’s the perfect way to prime your body for the A-List Diet and maximize your results over the long term. Phase Two focuses on the best weight-loss techniques I have used to date, and shows you how to personalize them to your dieter type. You’ll learn how to unlock the power of amino boosting and enjoy the A-List Diet lifestyle—how to eat real food that is truly satisfying and lose weight while you do it. This phase lasts until you reach your goal weight. Phase Three will help you stay healthy, maintain your weight loss, and look and feel younger for a lifetime. By this phase, your body is a lean, mean metabolic machine—and you’ll discover my simple guidelines for keeping it that way. I always recommend Phase One for my patients who are looking to jump-start their weight loss programs and for those who have been stuck in a cycle of yo-yo dieting. Phase One is designed to rid your digestive system of the toxins that are stored there. This helps restore balance to your digestive tract, also known as your microbiome. It is becoming increasingly clear that the health of our microbiome is a major player in weight loss. More studies are pointing out how certain bacteria in your gut, or lack thereof, could be making it harder to lose weight and harder to maintain an ideal weight, once you reach it. According to a recent study published in the journal Nature, people with a predominance of “bad” bacteria in their gut struggle with obesity, insulin resistance, dangerous lipid profiles, and higher levels of inflammation more often than individuals with a healthier microbiome. Just-published research also reveals that inflammation is one of the most overlooked obstacles to weight loss today. That’s why Phase One is so critical to help you hit the “reset” button, work toward a healthier microbiome, and prime your body for weight loss. All the do’s and don’ts for a successful Phase One are in my book, The A-List Diet. And you can complete Phase One in just 7 days. Reminder: Children, pregnant or lactating women, and people with uncontrolled medical conditions should not participate in Phase One. Always talk to your doctor before undertaking any new weight loss program. Phase Two of the A-List Diet is so innovative and effective because it unlocks the power of amino-boosting. Amino acids are the building blocks of all protein, and protein is the building block of a healthy, lean body. BCAAs are the key to boosting metabolism, building lean muscle, AND trimming away stubborn belly fat—all with less effort. To find out your A-List Type, click here to take this short quiz. A-List Amino Booster, a “shortcut” for starting your A-List weight loss journey. This powdered drink mix is formulated with BCAA Essentials to help you curb hunger, boost your metabolism, and fuel your body for weight loss. It’s a great starting point for your personalized A-List Amino Boost plan. A.M. Jump-Start is the ultimate morning amino boost, designed to power up your muscles and kick your metabolism into high gear. Made with cocoa extract, the A.M. Jump-Start is also packed with antioxidant power and caffeine-free energy. Plus, the rich chocolate taste will satisfy every craving—without all the sugar and guilt. It’s caffeine-free, sugar-free, gluten-free, GMO-free nutritional support to help you reach your goal weight. P.M. Reboot, designed to soothe away the day’s free radical stress, and keep your A-List metabolism humming along until morning. It’s also formulated with the natural antioxidant power of turmeric, to promote a healthy inflammatory response, fight free radical damage, and help guard each component of your metabolic health. In Phase Two, you discover how to lose weight while eating real food! Gone are the days of bland diet food, or being stuck eating the same thing day after day. The A-List Diet includes detailed food recommendations, meal planning advice, and more than 100 too-good-to-be-true recipes to help you maximize your weight loss. Best of all, you don’t have to be a celebrity chef to prepare these incredible A-List favorites. You’ll discover that these recipes are delicious, affordable, and can be often be whipped up in 30 minutes or less! Congratulations, you’ve reached your goal weight! Now what? Keeping yourself fit and healthy is usually the hardest part of any diet…but not the A-List. By now, you’ve transformed your body into a lean, mean metabolic machine—and you did it the healthy way, not by tricking your body with some fad diet that sets you up for the yo-yo effect. In Phase Three, I reveal how you can keep your metabolic machinery humming for the long haul—and how to avoid hidden dietary pitfalls that can sabotage your continued success. Important reminder: Talk to your doctor first. It’s important to talk to your doctor before starting any weight loss program or nutritional supplement. Only you and your doctor know your personal medical history, medical limitations, and special circumstances. Are you currently being treated for a chronic condition or taking prescription medication? It’s doubly important to talk to your doctor before starting the A-List Diet. For example, losing weight may change the dose or timing of your medication, and you must work with an experienced health professional for your own safety. If you are diabetic, changing your diet will change the amount of insulin you need. Since this diet is based on the powers of amino acids, if you have maple sugar urine disease, you absolutely cannot follow the recommendations in this book because you do not have the ability to metabolize branched-chain amino acids. And as stated in Chapter 3 of The A-List Diet book, there are certain groups who should never participate in Phase One, the Reset Phase. This includes children, pregnant or lactating women, and those with debilitating conditions that are not well controlled. Join the A-List for FREE and discover faster, easier weight loss! 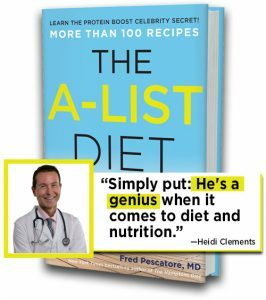 Dr. Fred’s A-List Celebrity Cheat Sheet for Even FASTER Results: Without eating less or lifting a finger.